National recipient of Simeon Booker Award for Courage – Ken Nwadike, Jr. peace advocate and director of Hugs Project, Inc.
Panel Discussion Requires Registration for Free Tickets at this link. 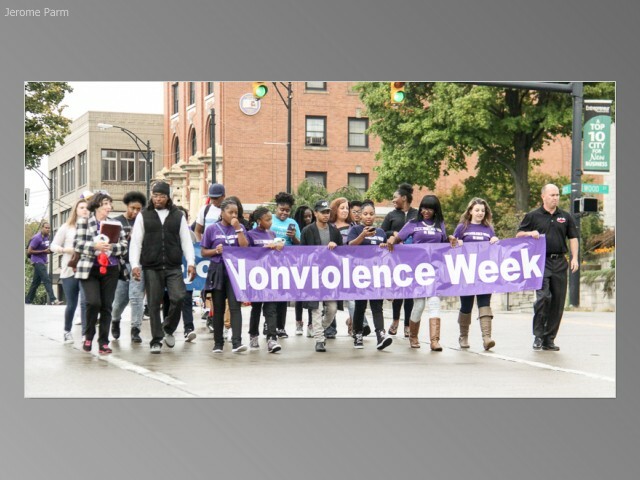 5-7 PM Wednesday, October 4 – Art award reception at Soap Gallery – All winners of the Nonviolence Art contest will have art work displayed at the soap gallery during the month of October. 4-7 PM Thursday, October 5 – Nonviolence evening at Barnes and Noble – book reading and art for elementary students, Youngstown Connection, “Raise your voice” – opportunity for young people to speak out, yoga, live radio broadcast, peace drink in the café, nonviolence art displayed on the walls, create bumper stickers to place on wooden VW bus and much more. 10 AM – 1 PM Saturday, October 7 – YSU Inclusive Awareness speaker at Flambeau’s on Market St. – Dr. Jesse Thompson, University of Illinois Urbana/Champaign Campus. 4-7 PM Saturday, October 7 – YSU Inclusive Awareness speaker at YSU – Dr. Jesse Thompson, University of Illinois Urbana/Champaign Campus.